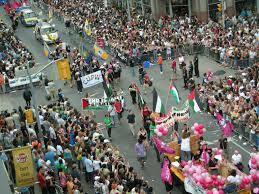 The Gay Parade in Toronto has been a long tradition and has been enjoyed by thousands of Canadians. The Parade is part of a long Pride celebration and since Toronto is in close proximity to Hamilton, it has become an important part of the LGBT community in Hamilton as well as other parts of Canada. The LGBT parade is one that is enjoyed each year and attracts more than half a million visitors. With exciting costumes, events and music, the Pride festival in Toronto is one that should not be missed. Since 1981, the LGBT Parade in Toronto has been enjoyed and it is one of the largest in all of Canada. In 2017, the Parade attracted hundreds of thousands of people as they celebrated the 37th Pride celebration in June. In 2014, Toronto was the proud host of World Pride, which drew even more visitors and many members of local LGBT communities in Canada. While there are other Pride festivals in Canada, Toronto has been the main attraction for many years and is known to offer one of the most enjoyable parades in the country. The parade is just one of the great parts of Pride week celebrated in Toronto and visitors can enjoy entertainment in many nightlife spots, restaurants and bars throughout the city. Even though many go to enjoy the unity and support offered by the gay parade Toronto, it has not come without controversy. The Pride Week that is celebrated in Toronto has been a growing event over the years but there have been allegations that the event has become too commercialized and has been dependent on various corporate sponsors. The problem lies with many groups within the LGBT community feeling as though they have been marginalized in favor of these commercialized sponsors and agendas. Smaller community groups are unable to afford to fees to participate in the parade. In 2010, Blackness Yes! Was concerned that the program was being forced to move from a traditional space where a dance part was held to unsuitable locations in small parking lots. In 2015, Pride Toronto had to withdraw applications that contained the phrases Trans Pride and Dyke March due to the reactions from lesbian and transgender people. During the week of the Pride Festival Toronto, there are three major parades that take place and they march to celebrate sexual diversity and gender in all forms. The Trans Pride March was founded in 2009 and is one of the largest events for the Canadian trans community. The Toronto Dyke March celebrated the strength, power and diversity of women in the LGBT community. Close Off Pride is the main parade event and features more than 150 groups that participate, offering performers, floats, costumes and music. 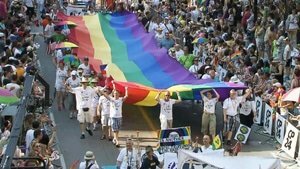 With these three major parade events, Gay Pride in Toronto has become a top choice for those in the LGBT community from many locations within Canada and LGBT events also attract many from the US.